A 36-year-old female presented to the Emergency Treatment Center (ETC) of the University of Iowa Hospitals and Clinics (UIHC) with one day of right eye pain, photophobia and decreased vision. There was no history of trauma. 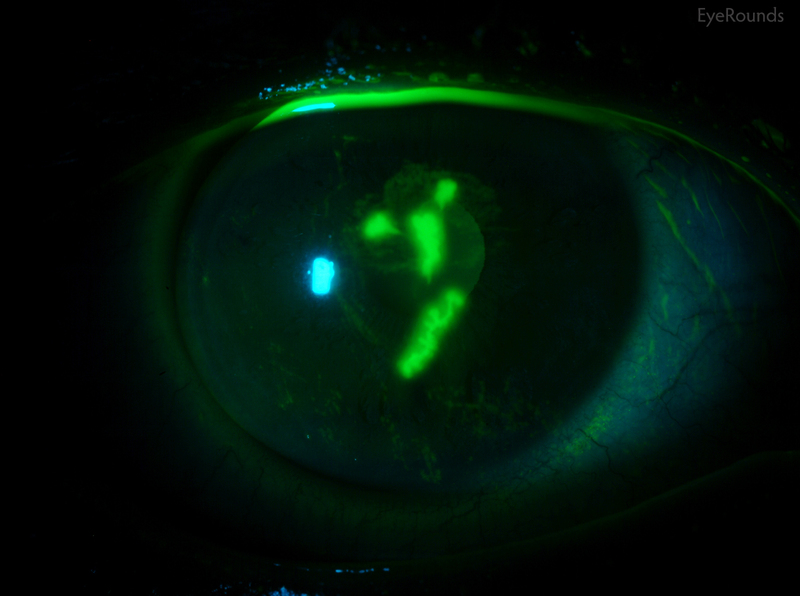 The ETC physician performed fluorescein staining and made a diagnosis of a corneal abrasion. The patient was treated with topical trimethoprim-polymyxin (Polytrim) four times daily and oral acetaminophen-hydrocodone 10/500 (Lortab) as needed for pain relief. She was instructed to follow-up with her eye care provider the next day if symptoms did not improve or resolve. The following day, her symptoms did not resolve and was therefore referred to the UIHC Cornea service for further evaluation. Figure 1. Slit lamp photo demonstrating classic epithelial dendrites in our patient after fluorescein staining. During the first ten days of treatment, all subjective symptoms resolved with the exception of mild blurring of vision. On Day 11, the best-corrected spectacle visual acuity (BCSVA) had improved to 20/30 with further pinhole improvement to 20/25. On slit lamp examination, the epithelium was intact without residual dendrites. There was, however, patchy anterior stromal inflammation in the visual axis that did not resemble the characteristic post-dendritic "footprints" and was felt to represent early immune stromal keratitis (Figure 2). Treatment was initiated with topical prednisolone acetate 1.0% QID, while maintaining antiviral and prophylactic antibiotic coverage. After two weeks of treatment, the BSCVA improved to 20/20. The anterior corneal inflammation cleared completely. While maintaining prophylactic antiviral coverage (acyclovir 400 mg PO twice daily) and discontinuing prophylactic antibiotic coverage, the topical corticosteroid regimen was tapered as follows: three times a day (TID) for three weeks; twice a day (BID) for three weeks; daily for three weeks; every other day for three weeks, and then discontinued. She returned for routine follow-up one month after discontinuation of topical corticosteroids. She reported no discomfort, but had a mild decrease in vision. On examination, the BCSVA was 20/30, with further improvement with pinhole to 20/20. On examination, the epithelium was intact but there was mild patchy anterior stromal haze in the same distribution in the visual axis as before. Corneal sensation was now mildly decreased. There was no peripheral stromal vascularization, perineuritis, endothelial or anterior chamber inflammation. Within three weeks of re-initiation of topical steroid therapy (with provision of full antiviral coverage), the BSCVA improved to 20/20 and the anterior stromal haze almost completely resolved. After six weeks, the anterior stromal haze had completely resolved. Oral antiviral therapy was reduced to prophylactic levels, while a very slow topical steroid taper proceeded as follows: prednisolone acetate 1.0% BID for two months and then daily for two months, followed by a switch to loteprednol etabonate 0.5% (Lotemax) daily. There are plans in the future to continue indefinite maintenance of prophylactic antiviral therapy while proceeding with continued corticosteroid taper as follows: prednisolone acetate 0.12% (Pred Mild) daily for two months, every other day for two months, twice weekly for two months, and then weekly for an indefinite period. HSV is a double-stranded DNA virus that causes disease after direct contact with skin or mucous membranes by virus-laden secretions from an infected host. Once in the tissue, the virus spreads from the site of the initial infection to the neuronal cell bodies, where it can lie dormant for years until reactivation occurs. It has been found that almost 100% percent of people in the United States over the age of 60 harbor HSV at autopsy. The two most common forms of HSV are HSV-1 and HSV-2. HSV-1 is generally associated with oral-labial infections and HSV-2 with genital infections, though crossover does occur. For example, HSV-2 can infect the eye through ocular contact with genital secretions or in neonates as they pass through the birth canal. 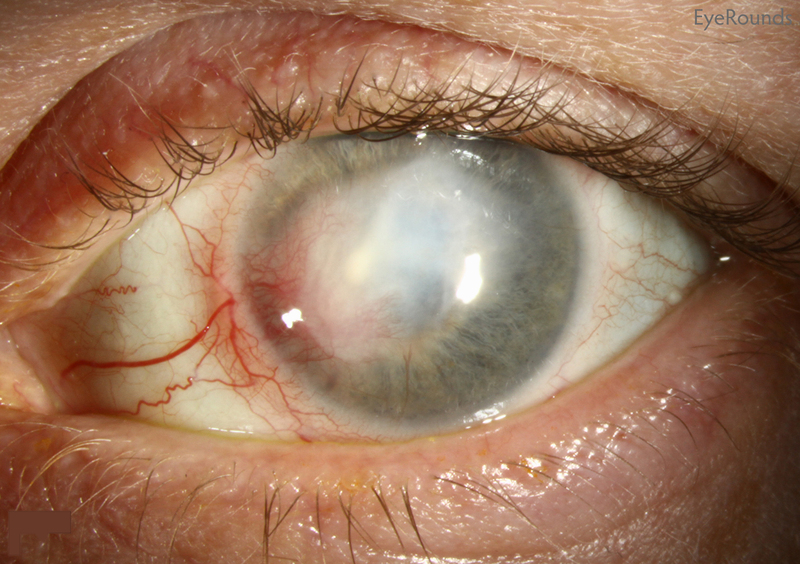 HSV keratitis is the most common corneal infection in the United States. 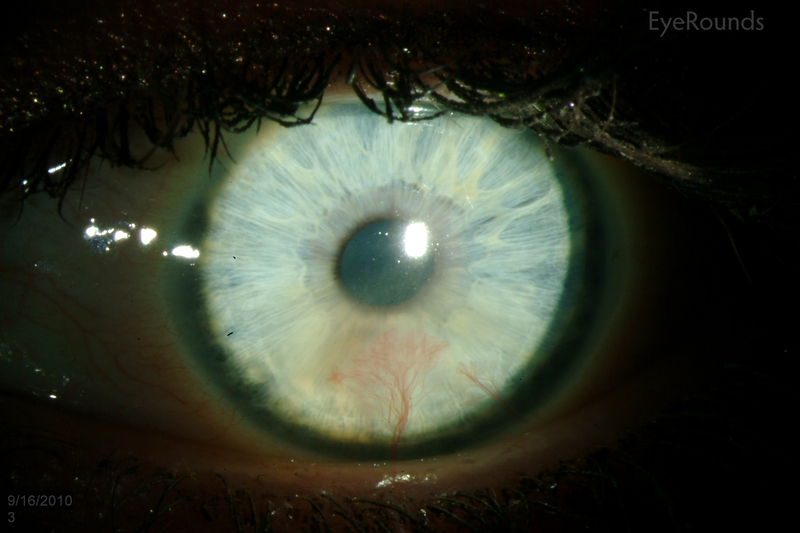 It is the number one cause of corneal and infectious blindness and a leading indication for corneal transplantation. The true incidence of HSV keratitis has been difficult to determine, but there are estimated to be 500,000 people in the U.S. with HSV-related ocular disease, with approximately 20,000 new cases and 28,000 reactivations each year. Primary ocular HSV infections are more common in children and are often associated with a viral prodrome and characteristic periocular herpetic blisters. Most ocular HSV infections, however, are secondary infections that occur after virus from a primary oral-labial infection becomes reactivated within the trigeminal ganglion and spreads to the eye by means of the ophthalmic (V1) branch of the fifth cranial nerve. Classic risk factors for reactivation are thought to include stress, illness, menses, immunosuppression, sun exposure, fever, and trauma, though these were not born out by the Herpetic Eye Disease Study. 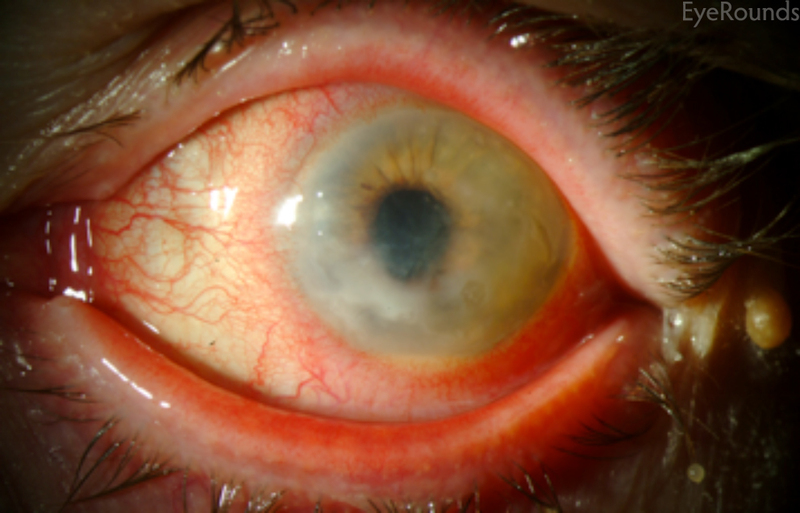 The most significant risk factor for HSV keratitis is a past history of ocular HSV. The recurrence rate for HSV may be as high as 25% in the first year and 33% by the end of the second year. HSV keratitis can present with involvement of the corneal epithelium, stroma, or endothelium, with or without associated inflammation of the anterior chamber (Table 1). 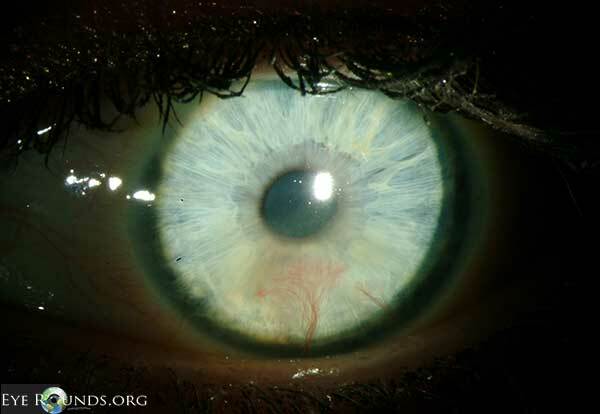 [1-4] Pathophysiologic manifestations may be related to the presence of live virus, immunological reactions to viral antigen, or secondary to previous herpetic injury ("metaherpetic"), particularly the loss of corneal sensation. Most cases (> 90%) are unilateral, but bilateral cases may occur, especially in atopic or immunocompromised patients. The diagnosis of HSV keratitis is primarily clinical, although additional tests may be useful in providing confirmation, but never exclusion. [1-4] The Tzanck (Giemsa) smear of multinucleated epithelial cells is a quick test with high specificity but low sensitivity. Viral culture remains the gold standard with high sensitivity for detection of the virus. Other tests include a viral antigen assay and polymerase chain reaction (PCR), which has the highest specificity. It should be noted that these tests are only positive when live virus is present as seen in HSV epithelial keratitis and cannot be used to diagnose, or exclude, active disease caused by immunologic reactions against HSV triggered by prior infections, which is typically the case for HSV stromal keratitis. In chronic cases, demonstration of decreased sensation by Cochet-Bonnet aesthesiometry can be helpful in differentiating true recurrent dendritic keratitis from pseudo-dendritic keratitis, especially that related to recurrent epithelial erosions. Bacterial and fungal cultures, along with confocal microscopy, can be used to rule out other etiologies of microbial keratitis. HSV epithelial keratitis invariably involves active viral proliferation. [1-4] The classic epithelial dendrite is the most common presentation of epithelial disease (Figure 1). It represents areas of epithelial breakdown due to cell destruction by proliferating virus and is best demonstrated after fluorescein staining under cobalt blue lighting. Adjacent epithelium stains with rose bengal in a "terminal bulb" configuration and represents intact, virally-infected epithelium. In immunocompetent individuals the herpetic epithelial disease is self-limited and will resolve, even in the absence of pharmacologic intervention. Faint anterior stromal opacities corresponding to the dendritic epithelial defect (often referred to as "footprints") may persist for some time and should not be mistaken for active stromal disease. In atopic or immunocompromised patients, or eyes with localized immunosuppression (e.g. topical corticosteroid use), the dendritic epithelial defects may continue to grow and coalesce to form characteristic geographic epithelial defects. HSV stromal keratitis is associated with the highest and most severe morbidity of any ocular herpetic disease. [1-4] Although this condition frequently follows previous HSV epithelial keratitis, it can be the initial presentation of ocular herpetic disease. The vast majority of cases are an immune stromal keratitis (ISK), which involves the antibody-complement cascade against retained viral antigens in the stroma. The quintessential manifestation is a mid-to-deep stromal infiltrate that is associated with an intact epithelium and minimal stromal necrosis and thinning (Figure 3). However, the initial presentation may be multiple areas of diffuse stromal haze (such as that in our case presentation) that is often dismissed by clinicians as "chronic stromal scarring." Chronic ISK may be associated with progressive mid-to-deep stromal vascularization, with or without associated lipid keratopathy and permanent corneal scarring (Figure 4). 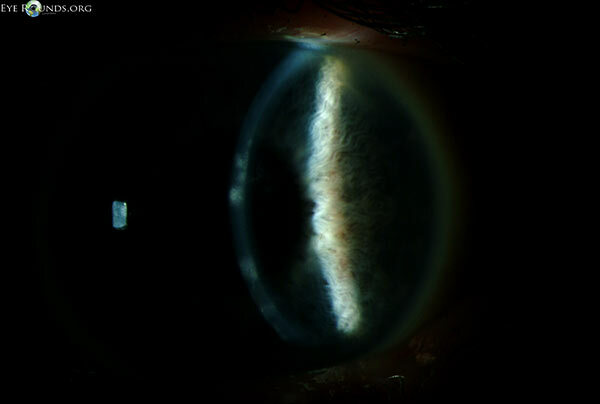 Necrotizing interstitial keratitis (NIK) is a rare manifestation that is believed to be associated with live viral proliferation within the stroma. 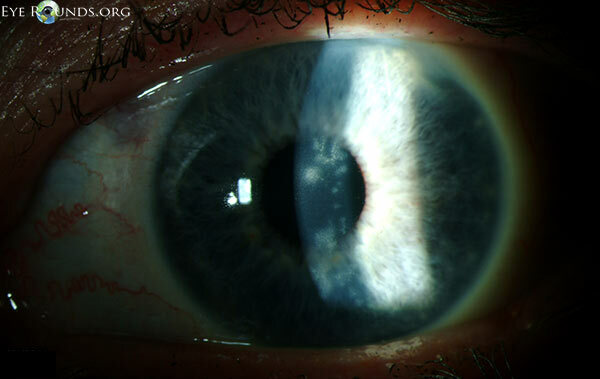 It presents with an epithelial defect, dense stromal infiltration, and progressive necrosis that often results in corneal perforation. It is often difficult to differentiate from culture-negative bacterial or fungal superinfection. Neither ISK nor NIK is self-limited and failure to provide appropriate pharmaceutical intervention will result in progressive corneal scarring and visual impairment. HSV disciform (endothelial) keratitis is a cell-mediated immune reaction to corneal endothelial tissue that presents with diffuse stromal edema. [1-4] In approximately half of cases, there is no prior history of HSV epithelial keratitis. Accordingly, acute-onset, unilateral corneal edema should be considered to be due to herpetic eye disease unless proven otherwise. Clinical findings include corneal stromal edema that is almost invariably confined to the central cornea (Figure 5). In advanced cases, microcystic epithelial edema may be present as well. 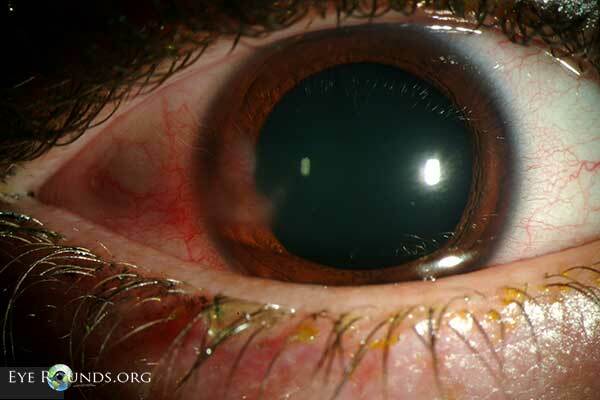 Although keratic precipitates are often present, they may be difficult to see due to the corneal edema. The condition responds remarkably well to treatment with topical corticosteroids with restoration of endothelial function and resolution of corneal edema. In neglected cases, permanent endothelial cell injury and corneal decompensation may occur. HSV keratouveitis may occur as a separate entity or in association with herpetic epithelial, stromal, or endothelial disease. [1-4] It may be granulomatous or non-granulomatous and may, in some cases, be associated with live virus (Figure 6). 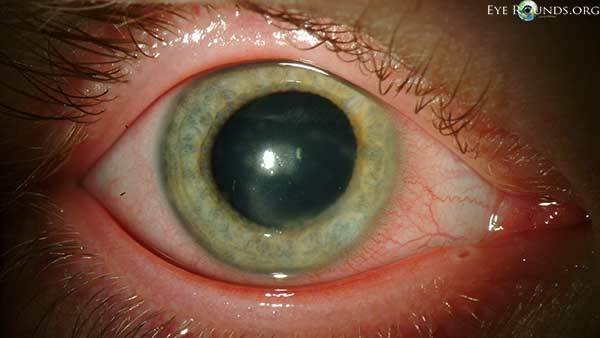 Acute trabeculitis may result in an acute rise in IOP. 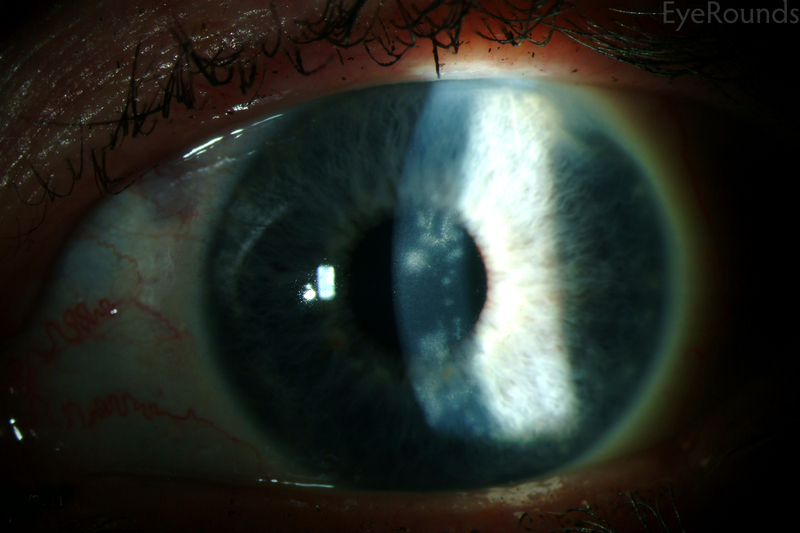 The presence of keratouveitis mandates a thorough funduscopic examination to exclude concomitant acute retinal necrosis. Metaherpetic manifestations of HSV keratitis include neurotrophic keratopathy and microbial (i.e. bacterial and fungal) superinfections. Neurotrophic keratopathy is a non-healing, non-infectious epithelial defect in a patient with HSV keratitis caused by decreased corneal innervation, decreased production of tears, or topical medication toxicity (including steroids and topical antivirals). Unlike geographic ulceration, neurotrophic keratopathy is characterized by smooth borders and a central, interpalpebral location. Complications include thinning, perforation, scarring, and neovascularization. The treatment of choice for manifestations associated with live virus is antiviral medications, whereas immunological reactions must be managed with corticosteroids (Table 2). [1-4] Each case of HSV keratitis is unique and must be managed in accordance with the evolving clinical course, with particular attention to two factors: the presence of live virus, and the presence of active immune-mediated disease. A guiding principle is that prior to the onset of immune-mediated disease, control and elimination of epithelial manifestations is the highest priority. However, once immune-mediated disease has been established, management of stromal or endothelial manifestations, with their potential for irreversible visual impairment, has higher priority than control of epithelial disease. Although HSV epithelial keratitis is self-limited in most cases, the rationale for aggressive antiviral therapy is to prevent corneal nerve damage and potential future immunologic disease. Prior to the advent of antiviral therapy, simple epithelial debridement was the treatment of choice. Later, topical antiviral therapy supplanted debridement. However, corneal toxicity related to the topical antivirals available in the United States led to a preference on the part of many specialists to rely exclusively on equally effective systemic therapy. Our preference is to use acyclovir 400 mg PO five times daily or valacyclovir 1000 mg PO three times daily. We limit use of topical antiviral therapy to oral therapeutic failures. Although most practitioners prefer a short course of therapy, we treat our patients for a total of 14 to 21 days to ensure complete eradication of replicating organisms. After successful treatment, therapy can be discontinued without tapering, unless long-term prophylaxis is used (see below; antiviral prophylaxis). Whereas the decision to introduce antiviral and/or corticosteroid therapy is relatively straightforward, tapering and/or discontinuation of these medications is quite complex and is the most common source of therapeutic setbacks in the management of the immune manifestations of herpetic eye disease. Anti-inflammatory therapy should be maintained at the initial dose until complete control of active inflammation has been achieved, after which the regimen should never be tapered by more than 50% at any one time. Following each dosage reduction, it is important to ensure that the same degree of control of inflammation is maintained; if not, it is mandatory to return to the prior regimen. The most common mistake in the management of HSV keratitis is premature termination of topical steroid therapy. In such cases, there is almost invariably a reappearance of corneal inflammation that is mislabeled as "recurrent" disease, when, in fact, it is actually a "pseudo-recurrence" that is merely a continuation of the same immunological reaction that has now become clinically apparent due to therapeutic withdrawal. In the present case, we chose to discontinue topical steroids a bit more prematurely than our standard protocol (see below) because this was an initial episode of ISK and it was very mild. Nonetheless, reappearance of anterior stromal inflammation in exactly the same location and pattern confirmed that our apparent clinical cure had simply been suppression of the active process to subclinical levels. In our clinics, the taper for stromal keratitis and keratouveitis is only one-third complete when it has been reduced to prednisolone acetate 1.0% once daily. After that, it is two-thirds complete when it has been reduced to prednisolone acetate 0.125% daily and it is not complete until it has been reduced to prednisolone 0.125% once weekly. For endothelial keratitis, the taper is one-half complete when it when the regimen has been reduced to prednisolone acetate 1.0% to once daily and not complete until it has been reduced to prednisolone acetate 0.125% every other day. The introduction of oral antiviral prophylaxis constituted a major advance in the management of chronic herpetic eye disease. The Herpetic Eye Disease Study (HEDS) from the National Eye Institute found that the use of oral acyclovir 400 mg PO BID (or equivalent) was effective in (1) significantly reducing the incidence of recurrent epithelial keratitis and stromal keratitis; (2) possibly effective in reducing the incidence of recurrent endothelial keratitis and anterior keratouveitis; and (3) ineffective in preventing epithelial disease from progressing to stromal keratitis, endothelial keratitis, or keratouveitis. There are no uniformly accepted guidelines governing the use of antiviral prophylaxis in conjunction with topical corticosteroid use in situations where live viral manifestations are not present. Due to the very high benefit-to-risk ratio associated with oral antiviral therapy, it is our preference to use these medications in every instance in which topical corticosteroids are utilized. For topical regimens of five or more drops of prednisolone acetate 1.0% or equivalent a day, we use full antiviral dosing of acyclovir 400 mg PO five times a day; for regimens of three or four daily drops we do one-to-one frequency matching of the topical and oral medication; and, for regimens of two or fewer drops, we utilized the standard prophylactic dose of 400 mg PO BID. 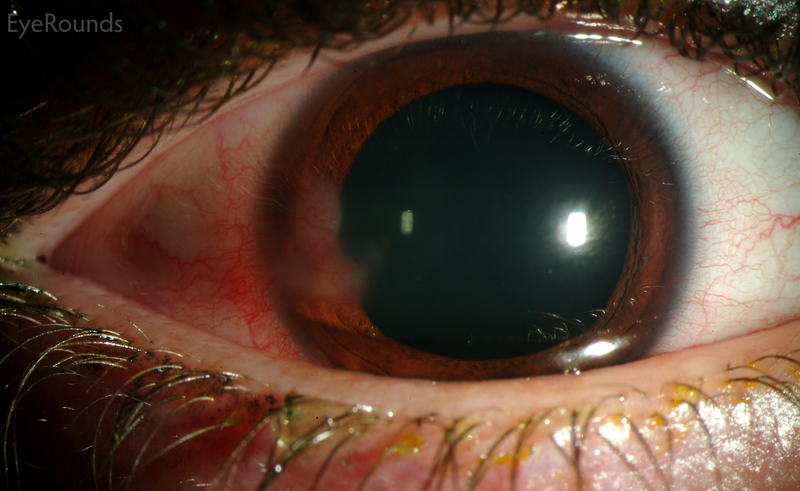 Acute surgical intervention is seldom necessary in the management of HSV keratitis. Rarely, progressive stromal thinning with impending or actual perforation may occur in NSK or severe cases of ISK, particularly when secondary bacterial or fungal superinfection is present. 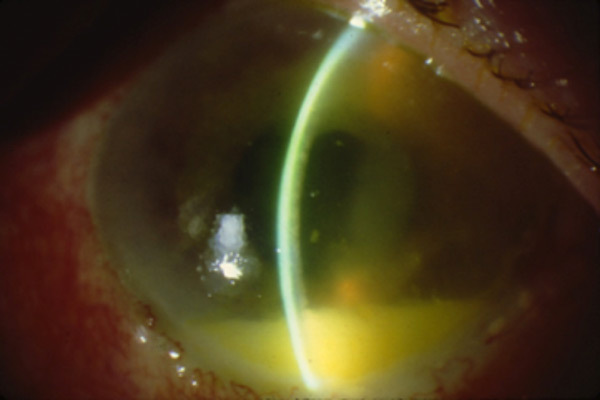 More commonly, impending or actual perforation is associated with metaherpetic manifestations of decreased corneal sensation and a persistent epitheliopathy with or without secondary superinfection. 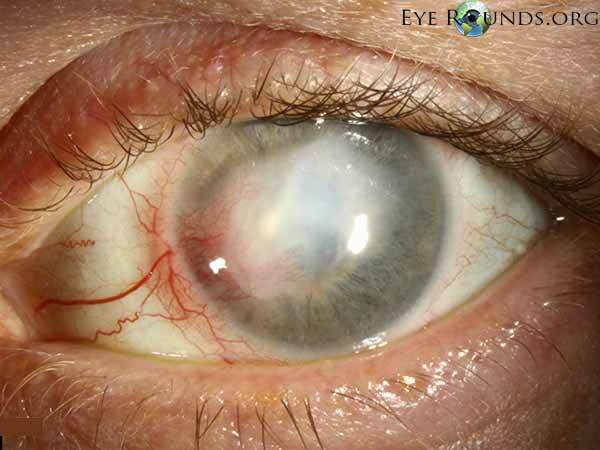 In either case, conservative surgical intervention with application of cyanoacrylate glue is usually sufficient, although tectonic keratoplasty may sometimes be required to preserve the integrity of the globe. Adjunctive temporary or permanent tarsorrhaphy is recommended. Late surgical intervention is indicated for management of intractable corneal pain or visual impairment associated with herpetic disease. For painful eyes without visual potential, a Gunderson flap will reduce chronic inflammation and eliminate pain. For eyes with post-herpetic scarring and good visual potential, the surgical procedure is based upon the corneal pathology. Phototherapeutic keratectomy may be utilized as a keratoplasty-sparing intervention for superficial corneal scarring. There are unsubstantiated concerns that this procedure may be associated with activation of immunological stromal keratitis; in any case, perioperative use of full antiviral therapy followed by a prolonged prophylactic course obviates this issue. For deeper stromal scarring, penetrating or deep anterior lamellar keratoplasty are the procedures of choice. The prognosis for graft survival has improved dramatically over the last quarter century since the introduction of oral antiviral prophylaxis. This can be attributed to reduced recurrence of herpetic epithelial keratitis, a condition that is frequently associated with acute endothelial rejection episodes. In the unusual situation of corneal endothelial decompensation due to neglected or recalcitrant endothelial keratitis, endothelial keratoplasty can be performed if stromal disease has not been present. 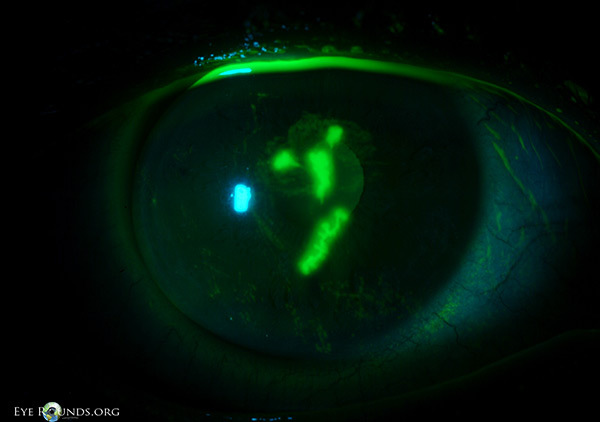 Epithelial keratitis- Dendritic epithelial defects with terminal bulbs. Base stains with fluorescein; adjacent epithelium stains with rose bengal. Stromal keratitis- Acute: mid-deep stromal infiltrate with intact epithelium and minimal necrosis. Chronic: mid-deep stromal vascularization, lipid keratopathy, scarring. Necrotizing: epithelial defect, stromal infiltrate, progressive necrosis +/- superinfection. 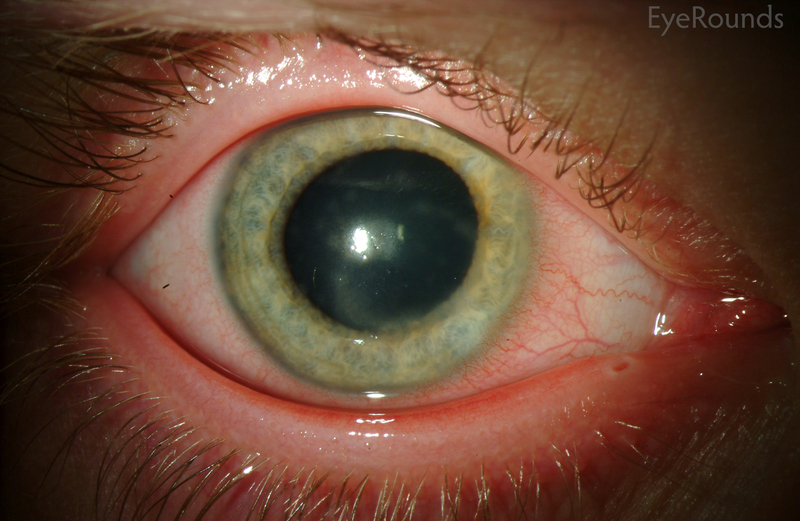 Disciform: Central corneal edema, microcystic edema, keratic precipitates. 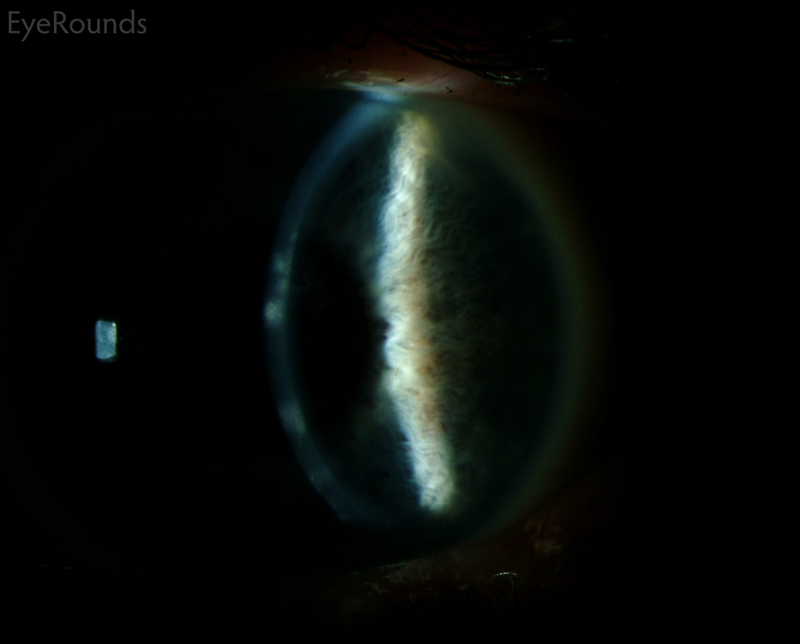 Keratouveitis: Granulomatous vs. non-granulomatous anterior uveitis, hypopyon, elevated IOP from trabeculitis. Metaherpetic: Neurotrophic keratopathy and superinfection. Epithelial disease: Full dose oral antiviral x 21 days. Consider debridement. Prophylactic oral antiviral in recurrent cases (for one year). Avoid topical antiviral if possible due to epithelial toxicity. 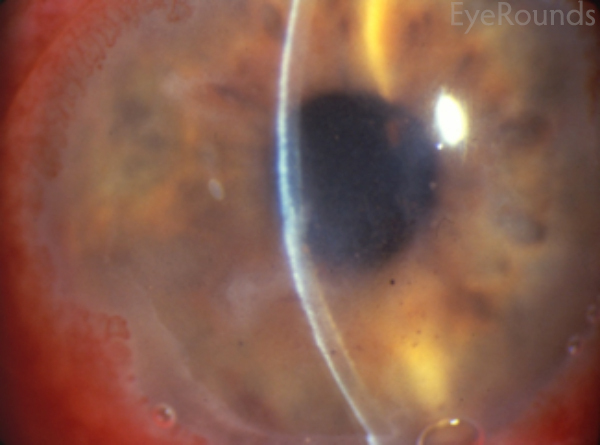 Stromal/endothelial/anterior chamber disease: Topical steroid with slow taper (see taper regimen above). Full dose oral antiviral followed by prophylactic oral antiviral (for 1 year up to indefinitely). Liesegang TJ, Melton LJ, 3rd, Daly PJ, Ilstrup DM. Epidemiology of ocular herpes simplex. Incidence in Rochester, Minn, 1950 through 1982. Arch Ophthalmol 1989;107:1155-9. Wang JC. Keratitis, Herpes Simplex. Emedicine. Accessed online from: http://emedicine.medscape.com/article/1194268-overview. Updated 8/7/2009. Herpetic Eye Disease Study Group. Acyclovir for the prevention of recurrent herpes simplex virus eye disease. N Engl J Med 1998; 339:300-6.